over 5,000 geo-locations – http://www.searchforecast.com/keyword-tags-publisher-directory/tags/paris – we are working with adnetworks to provide them with lists of additional advertisers being run on AdSense websites. This is very important for the folks at adnetworks who want to increase their advertising base. With high competition for the prized brand advertisers, there is a frenzy of activity to sign up more brand advertisers. SearchForecast’s AdSense Directory can locate where every major brand in the world is likely to run advertisements across Google’s Content Network because we know which AdSense websites are most relevant to those advertisers! We have released Publisher Directory Keyword API, designed to provide an open platform for advertising networks and agencies looking to help monetize publishers who run advertising such as Google AdSense. It is the first time we have opened up the millions of publishers and millions of keywords in a programming interface format which map the Google AdSense Publisher ecosystem around the world. We are not releasing it to the development community at large but working with specific clients. As detailed below, whilst Google charges $0.25 per 1,000 requests – SearchForecast plans to provide a more open API with fewer restrictions and more features for community building. Yesterday, a client pointed out to me what looks to be some serious shortcomings in the placement targeting tool on Google’s Content Network. Upon further investigation of the “mangaement placement tool” used to find AdSense websites within Google Adwords, I found that the keyword “expat” returned websites running in the Content Network that didn’t even exist. The most curious of these was the URL “8793.anonymous.google” (which doesn’t even exist as a website yet Google say it has 10,000 – 100,000 impressions per month).. Click on the image below! One of the benefits of our AdSense Directory is the open view of each keyword so you can view a summary of expat websites http://www.searchforecast.com/keyword-tags-publisher-directory/tags/expats. Google doesn’t provide that level of detail, limiting the decision making process when selecting websites within the Content Network. With over 400,000 AdSense publishers in the AdSense Directory, SearchForecast is providing more visibility into the AdSense ecosystem. Each publisher listed in the directory is connected by relevant keywords that each AdSense Publisher has actually written into their website, not keywords associated with it. 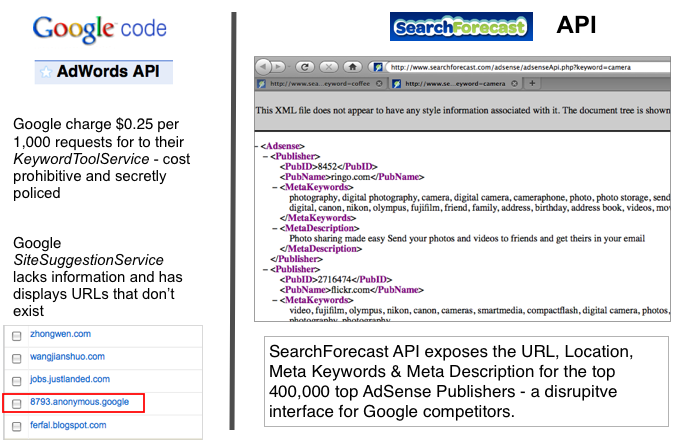 For example, at http://www.searchforecast.com/google_adsense_publisher_directory/Expatriates.com, we show the other keywords which were written by the publisher indicating their intent when scribing their website. The SearchForecast AdSense Directory has visitors from all over the world. In Europe, the Netherlands, Germany and France show the largest number of visitors to the AdSense Directory which is not surprising given the market share dominance of Google, particularly in Germany. What is interesting is that our crawler picks up AdSense Publishers in all countries – not only in English speaking AdSense websites. So if you are looking for AdSense publishers in Dusseldorf, you can search for publishers in German keyword. An example for an adveriser looking to target German travel websites would be flughafen, flugplan, abflug, departure, ankunft. One of the biggest analytical questions in the online advertising sector that remains largely a puzzle is how many AdSense websites there are and how much do they earn? Today, we’re pleased to announced that our AdSense crawler has collected and databased over 418,000 AdSense Publishers which can be viewed on the AdSense Publisher Directory. We are continuing the crawl and update our Directory every day with new AdSense Publishers. In some ways, we feel like we’re using the Abacus, the first calculating mechanism known to us. It was invented sometime between 1,000 BC and 500 BC by the Babylonians and it was reintroduced by Pope Sylvester II. Let’s hope it doesn’t take us a 2,000 years to crack the code on Google’s $7Billion AdSense publishing network. 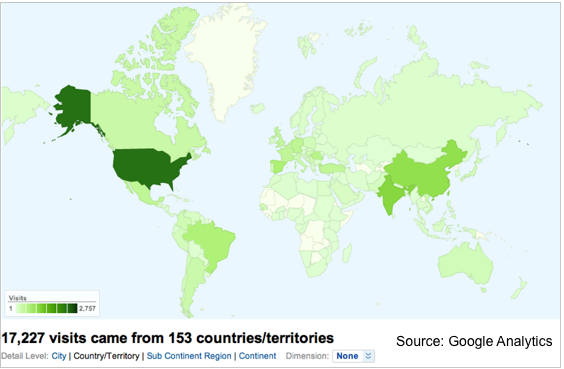 Over 17,000 visitors from 155 countries viewed the SearchForecast AdSense Directory in March 2010. 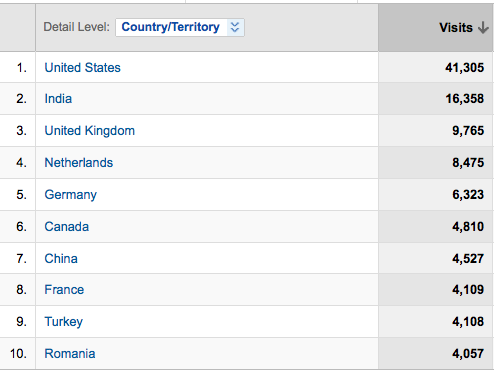 These visitors came from 3,859 cities! Each AdSense Publisher page includes resources to help publishers from around the world connect and learn how to increase revenues from their website. The AdSense Community is about 7 years old and contributes over $7 Billion of Google revenue each year. 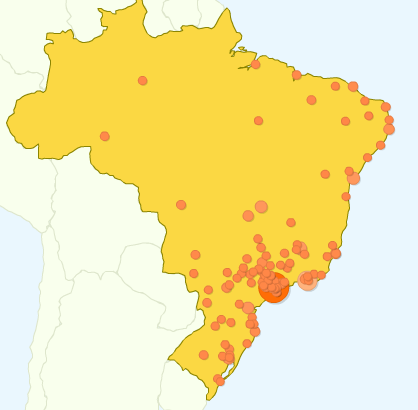 In March 2010, over 800 visitors from Spain and 700 from Brazil visited our AdSense Directory. The Latino/Hispanic AdSense Publishers represent a powerful force in global online publishing and offer amazingly untapped potential for adnetworks and advertisers. With over 350,000 AdSense Publishers listed in the AdSense Directory, our mission is to help connect those publishers in one country to others – helping them increase their knowledge and network in a particular field or area of interest. Together we can build a better world, understand more cultures, religions and make friends with our online neighbors as we share a common interest and passion – even though we may not live in the same country. Our mission at SearchForecast is to help the online publishing community connect. The AdSense Directory now features Google Maps, the AdSense Calendar & Video Tips. 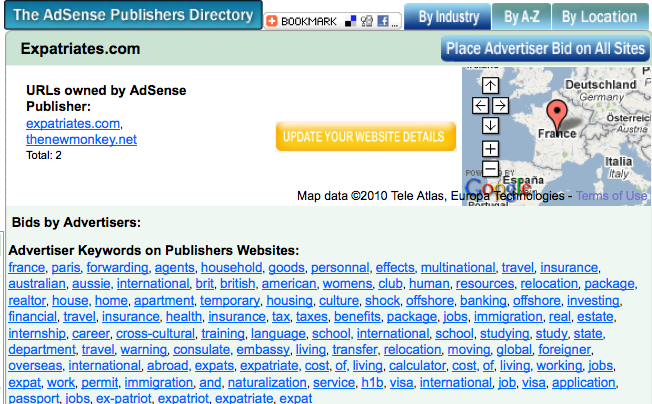 The AdSense Directory helps advertisers target globally orientated publishers. We have also added the AdSense Calendar to AdSense Directory Pages it allows AdSense Publishers to stay in touch with important dates for their online publishing business. We hope these additions to the AdSense Publisher Directory will improve the experience for both publishers and advertisers. How the AdSense Directory Crawler Technology Works? A question many people are asking is how does Searchforecast collect all the websites in the AdSense Directory. Our proprietary crawler has been running for many years now and each day collects websites that are running AdSense. Each day, we migrate the data and de-duplicate the database, so the websites and keywords are always fresh. 2: Updated the existing URLs, Title, Description & Keywords.